Sometimes when you desire to cook a pie pumpkin, sugar pumpkin, carving pumpkin or kabocha squash (also known as a Japanese pumpkin), it can be time consuming and straining on your hands to cut through and remove the thick tough rind, in order to cut the flesh down into cubes to use in cooking. Roasting helps to bring out the richness of the flesh, but this method usually takes a long time. Sometimes you just want a faster way to get at the cooked flesh, that you can then use easily in savory stove-top dishes, slow cooker meals or in baked goods. If that’s your experience as well, here is an easier way to prepare the pumpkin or kabocha squash flesh for your dishes! The quickest way I have found to cook pumpkins is to steam them, especially since I can leave the pumpkin wedges (or even half a small Kabocha squash!) steaming in a pot on the stove top while I get busy prepping other recipe ingredients or even start cooking a main dish. (Why is steam cooking recommended? Read here to learn about its benefits.) I like this method as I find it quicker than dealing with a rock hard pumpkin or squash and it causes less stress on my hands from chopping. It also cuts down on the stir-fry cooking time when I am using the pumpkin or squash in dishes. I sometimes even pre-steam the squash the day before and then keep it in the fridge so that I can prepare my desired stove-top, dessert or oven dish even faster the next day. If you get a big carving pumpkin, you can just steam a few wedge portions at a time in a steamer pot. A steam-cooked pumpkin or kabocha squash can keep in the refrigerator for up to a week. You can also slice up the steam-cooked pumpkin or kabocha squash into wedges and then freeze some of the extra wedges in the freezer using a freezer safe container, to save for use in a future recipe. Alternatively, scoop out the soft cooked flesh from the pumpkin skin, and transfer a measured amount into a freezer safe container (I usually portion the extra amount into one or two cup measurements), for easy removal from the freezer to thaw for the next baked recipe (just in time for making homemade pumpkin pie for Thanksgiving)! A simple way to prep your pumpkin or kabocha squash for fast main dish cooking, or a way to freeze up large portions for future cooking or baking. Heat water in the steamer pot with the pot lid closed (for more details on steaming pots or how to make your own, read here). Use a medium heat setting. Wash the outer surface of the pumpkin or kabocha squash well, cut it in half and then remove the seeds using a spoon. Then determine how much you need to cut it based on the size of the pumpkin or squash and your steaming pot. If you have a small pumpkin or kabocha squash and a big steaming pot, you might be able to steam half the pumpkin or squash at one time. If not, then cut down the pumpkin or squash into large wedges (no need to remove the rind) to steam a few wedges at a time. Once there is steam going within the pot, place a half pumpkin or kabocha squash (or large wedges) into the steamer pot, and let it cook (with the pot lid on) for 15-20 minutes or until just cooked through. You may turn down the stove heat setting to medium-low, as long as there is adequate steady heat to cause continuous steaming inside the pot. Check at the 15 minute mark to see if the pumpkin or squash is cooked through. 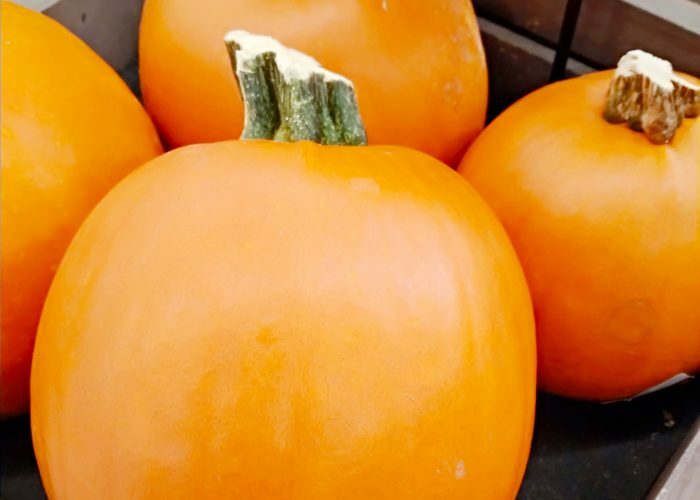 You can use a knife to pierce the skin of the pumpkin or squash to see if it goes through easily (the flesh should still be slightly crunchy and not overly soft). If still hard, steam another 5-10 minutes, checking periodically to see if the pumpkin or squash is cooked through. Once done, remove the pumpkin or squash immediately and set it on a chopping board to cool for about 5 minutes. Cut this slightly cooled pumpkin or squash in half (if not already cut into wedges). Then slice each half portion into wedges, cut away the outer rind with a knife (a fruit peeler also works well here), before chopping into cubes. If you already have steamed wedges, slice away the outer rind and then chop into cubes. You will find it very easy to work with the steamed flesh. If you are rushed for time, you can use the high heat setting, but check more frequently to see if the pumpkin or kabocha squash is steamed through just right, instead of being over-cooked and turning too soft. The key is to not over steam your squash, especially if you plan to use it as an ingredient in another dish. After the 15 minute mark, keep checking every 5-10 minutes by inserting a knife into the flesh of the pumpkin or kabocha squash to see if it is just ‘al dente’ tender done. The knife or fork should insert and can be removed relatively easily. If you have a large pumpkin or kabocha squash on your hands and you only want to steam cook a portion of it, wrap the cut portion of the raw pumpkin or kabocha squash in plastic wrap and store it in the fridge. A freshly cut raw pumpkin or kabocha squash can be kept this way in the fridge for up to a week.